Closed-Tread Softwood with 9mm Ply-Risers. Domestic Specification to Building Regulations. Strings are trenched, sanded, glued for Treads and Risers, then clamped, wedged and blocked, for minimum movement in the finished Staircase. All treads, risers, wedges and blocks are glued with an exterior-grade PVA Adhesive. Options available include newel-posts, bull-nose steps and kitewinders, if required. They can be made in a choice of timbers including Sapele-hardwood and Oak. 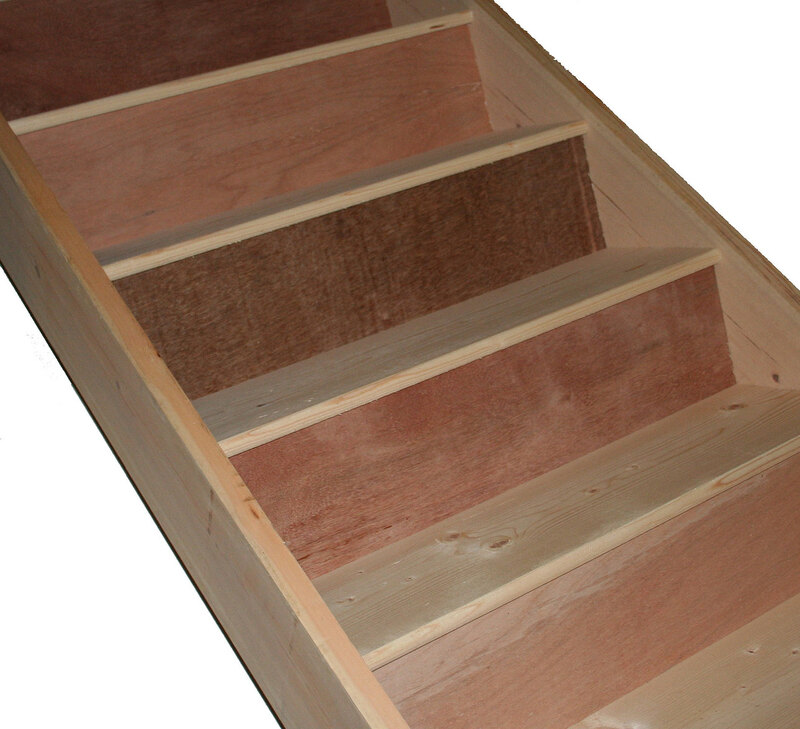 Treads can be made from MDF if required, and risers can be made from plywood. Domestic Specification to Building Regulations: Max. 220mm rise with 42degree pitch. Maximum width up to 915mm for the prices shown; poa for wider staircases. ex 9x1 PSE Whitewood Risers. Made to your dimensions up to 36" square - (poa for larger sizes). This price is for the kitewinder section only, poa for additions such as a stair section to go with the kitewinder, newel bases, bull-nose steps, solid pine treads, MDF, Hardwood or Oak etc. Be aware that an assembled kite winder is a large item - measure your access point carefully; A standard 33" door casing will have a clear opening of 29-1/2" or less depending on how far the door opens back - a 3 tread kite-winder stair section can measure 36" x 36" x 36" - so be warned! It may be possible to make the set as a kit for these circum­stances.